The manatee count at Blue Spring State Park on January 5th, 2018 was 453 according to Wayne Hartley, Manatee Specialist. Wayne said he believes this count was the “highest” he has ever recorded! Greetings! I know January has the coldest weather in Florida and in this New Year; it’s sure living up to it! 453 of us manatees huddled together in the warm 72 degree Fahrenheit water at Blue Spring State Park; Tallahassee had measureable snowfall on January 3rd 2018 for the first time in nearly 30 years. And if that wasn’t crazy enough record breaking news for you, there were frozen iguanas falling out of trees as they became paralyzed from the unusually cold central and northern Florida temperatures! As you probably already know, manatees are warm-blooded and we need water temperatures of at least 68 degrees Fahrenheit to survive or we could die from cold stress. Well, the St. Johns River adjacent to Blue Spring State Park in Orange City, Florida was a very chilly 48 degrees Fahrenheit. Needless to say, hundreds of us manatees took shelter in Blue Spring as we took advantage of the spring’s year-round balmy 72 degrees Fahrenheit temperatures! 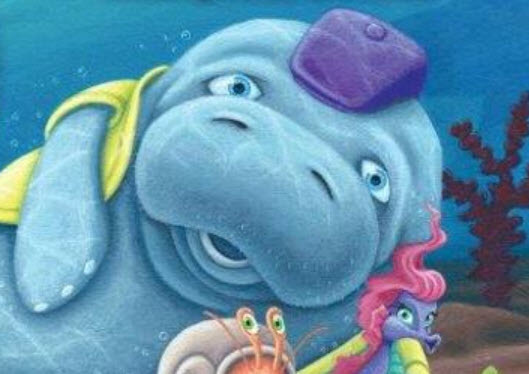 And just another reminder for you, my author, Robert Scott Thayer will be doing a book signing from his award-winning Kobee Manatee Children’s Educational series at the Manatee Festival in Blue Spring State Park on Saturday, January 27th and Sunday, January 28th! 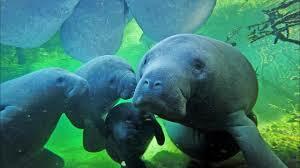 To get the latest manatee count at Blue Spring State Park, please call the park at: 386-775-3663. If you see any sick or injured manatees, please call the Florida Fish and Wildlife Conservation Commission at: 1-888-404-FWCC. They are the folks who are responsible for rescuing us in Florida. 453 Manatees Snuggle in Blue Spring While Frozen Iguanas Fall from Florida’s Trees – Baby It’s Cold Outside! Author Robert Scott Thayer is also a recording artist who writes and sings in the pop, jazz, and children’s genres. Robert has won several International Songwriting Awards including those from Billboard. His newest children’s tune, Kobee’s Song, produced by 2012 Grammy winner Jim Cravero, is fun, upbeat, and has a solid reggae groove. It’s about the clever protagonist, KOBEE MANATEE, in Thayer’s first children’s informational picture book.